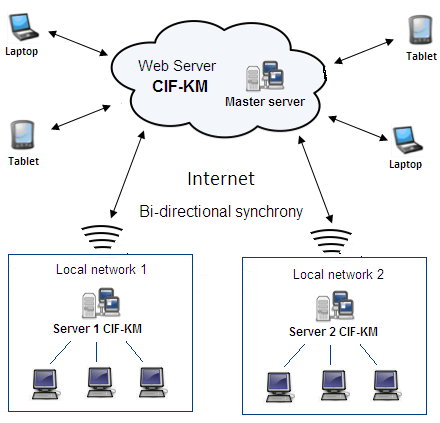 In CIFKM one may work with multiple servers synchronized bidirectionally. It is an economical way of distributing the work load and increasing security. It is particularly suitable for companies with multiple establishments that can be locally served by a server synchronized online with other "master". In the figure is shown an example of several servers synchronized. A server acts as master and the rest (which support both local networks) are synchronized bidirectionally with it. Also, the master server renders service to various devices directly via Internet. The synchronization takes place at each modification (event). For the set to work in harmony, the master server, apart from lending the service of synchronization of the contents of CIFKM, is in charge of the automatic update of the application in the secondary servers and these, in turn, of the automatic update of the client programs installed in the workstations when these connect. It is important to evaluate the convenience of hosting the master server in a virtual machine in the cloud, because of its reliability, easy scalability and the quality of the Intenet connection. Working with servers synchronized via Internet is the best way of optimizing the use of Internet to maximize the quality of the service, the security and reliability, with the least cost possible. The scalability is achieved increasing the number of secondary servers synchronized via Internet with the master server. Each secondary server attends to a set of users via the local network or directly via Internet. Workload is distributed among the servers, which allows for a greater service quality. On the other hand if the company has several establishments it can place a synchronized CIFKM server to provide local service. Data bases and all information contents are replicated in every server, so that any of them may provide service to the users via the local network or Internet. 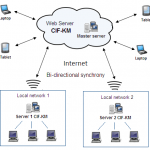 With this distributed architecture of multiple servers,CIFKM will always be available to provide service to the users. The synchronized servers may be physical or virtual machines of standard size, that are more economical than singular larger computers of greater power due to their greater diffusion, and they provide similar benefits as a whole.